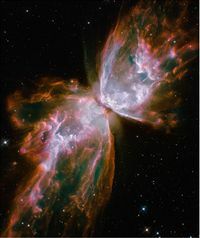 The Butterfly nebula (NGC 6302) is a planetary nebula in the constellation of Scorpius. Emanating from the star at its centre are two enormous lobes of gas and dust, giving it the appearance of a butterfly. Thought to have formed 1,900 years ago, it is also known as the Bug nebula. It is known that Edward Emerson Barnard observed the nebula in 1880, though some sources suggest James Dunlop may have discovered it in 1826. the first record of observation was in 1907 by Edward Emerson Barnard. The nebula is believed to be 2.7 light years across and have a mass of around 5 solar masses. The nebula is called a "bipolar planetary nebula" due to the to large gas/dust lobes that point in opposite directions. There also may be two smaller lobes. There is a star situated at the centre of the nebula, where the two lobes intersect. However, it has not been detected due to the presence of a large dust lane, obscuring our view in visible light. The two lobes are composed mainly of dust and gas and believed to have temperatures of 18,000 k. Expanding at 270 km/s, the northwestern lobe is believed to have formed 1,900 years ago. It 2013, it was found that the nebula was one of several bipolar planetary nebulae that preferred to align their long axis with the plane of the galaxy. This only appears to be true for bipolar planetary nebulae. This is believed to be caused by an external force, such as the strong magnetic field produced by the bulge at the centre of the Milky Way. It also suggests that galactic magnetic fields have a larger effect on the galaxy than previously thought. The shape of the lobes comes from the rotation of the system. The star located at the centre of the nebula is thought to have a mass of 0.64 solar masses. It is one of the hottest stars known, with a surface temperature over 200,000 kelvin, 34 times hotter than the Sun. This high temperature means that most of its light is emitted in the ultraviolet region of the electromagnetic spectrum, adding to the difficulty in observing it due to dust. The ultraviolet light it emits illuminated the nebula in a similar way to an emission nebula. This page was last modified on 5 February 2018, at 12:56.